When August Frugé joined the University of California Press in 1944, it was part of the University's printing department, publishing a modest number of books a year, mainly monographs by UC faculty members. 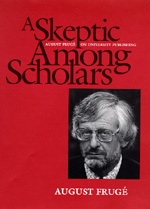 When he retired as director 32 years later, the Press had been transformed into one of the largest, most distinguished university presses in the country, publishing more than 150 books annually in fields ranging from ancient history to contemporary film criticism, by notable authors from all over the world. August Frugé's memoir provides an exciting intellectual and topical story of the building of this great press. Along the way, it recalls battles for independence from the University administration, the Press's distinctive early style of book design, and many of the authors and staff who helped shape the Press in its formative years. August Frugé (1910-2004) was the Director Emeritus of the University of California Press.